Above: Mayor Stephanie Rawlings-Blake at a Federal Hill awards ceremony where Baltimore’s sustainability efforts were lauded. 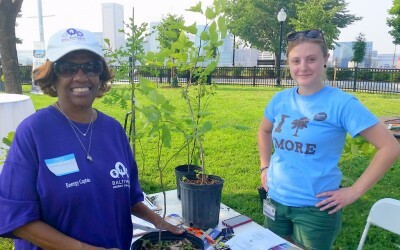 Winning praise for its efforts to improve the urban environment, Baltimore has been given the highest rating possible for sustainability programs by a D.C.-based non-profit. Only two other cities (Northampton, Mass., and Seattle) have achieved a five-star rating from STAR (Sustainability Tools for Assessing & Rating) Communities. Baltimore, it seems, beat out Portland, Washington D.C., and Austin, Texas, for the distinction. At an announcement event held at Federal Hill Park last Friday, the award got Mayor Stephanie Rawlings-Blake pretty revved up. “I’m very competitive. . . 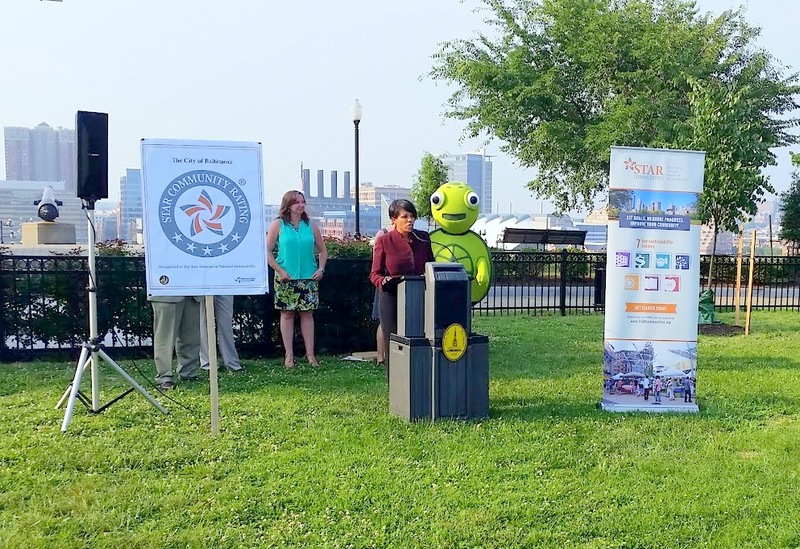 I love that we are standing here, I could not be more proud of our efforts to make Baltimore more sustainable,” she said, addressing a crowd that included officials from STAR, staffers from the Baltimore Office of Sustainability, Tree Baltimore and other groups. “I am honored to accept this recognition on behalf on the city of Baltimore, our residents, our business, and our partners, who contribute on a daily basis to the sustainability and resilience of our city,” the mayor said. The city was judged on its accomplishments and programs in STAR’s seven main goal areas: Built Environment, Climate and Energy, Economy and Jobs, Education and Arts and Community, Equity and Empowerment, Health and Safety, and Natural Systems. During the 14-month application process, the Office of Sustainability gathered information from all over the city and Baltimore stood out in several areas, officials said. The city’s 14 acres of land used for urban agriculture, for instance, earned Baltimore high points. STAR also regarded Baltimore’s revising of city codes to allow the raising of goats, chickens and bees a plus as well. Residents will breathe easier to know that another high-scoring area comes in the category of air quality. Baltimore has reduced greenhouse-gas emissions by nearly 18% in the past five years, according to sustainability officials. Businesses and non-profits report their practices – on everything from paper and plastic recycling to energy conservation – as part of the Carbon Disclosure Project. City officials say they achieved the reduction in Baltimore’s greenhouse gas output by encouraging private businesses and residents to adopt greener technology and lifestyles, such as using more sustainable energy sources and increasing the use of carpooling. mass transit and biking. The Domino Sugar plant, for example, did its part by installing solar panels, officials said. The Baltimore Energy Program and Tree Baltimore were also featured at the event. The energy office provides free efficiency consultation and installation for all city residents and also provides grants to schools to fund green energy projects. Tree Baltimore has committed to a plan to increase tree canopy cover throughout the city from 27% to 40% by 2037. “We are working hard to ensure that the trees we plant survive and have proper maintenance,” said Kristin Baja, the city’s climate and resilience planner, speaking afterwards with The Brew. ” That is being done with all of our partner tree organizations and with our courses such as TreeKeepers,” Baja said. STAR officials addressed the gathering as well. “Certified Star communities are reporting that working towards STAR certification helps them to gain a deeper understanding of their community’s strengths and their needs,” said Hilari Varnadore, the executive director. Varnadore, who handed the award to the mayor, ticked off a long list of side benefits she said the certification process produces for communities.